Situated next to the Jellystone Warrens resort in a tranquil woodland setting, Warrens Lodging offers luxurious villa-style vacation accommodations and a home-away-from-home ambiance. 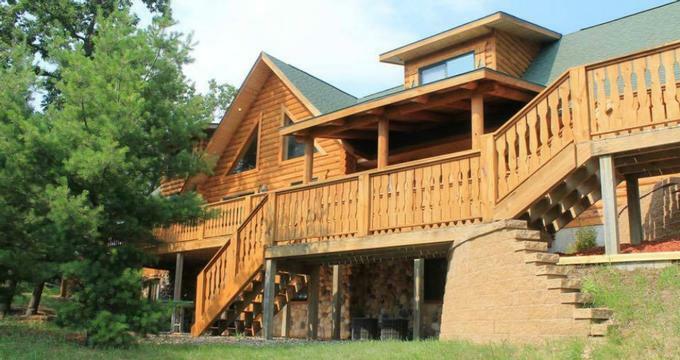 Located a few miles from the Wisconsin Cranberry Discovery Center and the McMullen Memorial County Park, the family-friendly retreat features seven well-appointed, multiple-bedroom villas with fully equipped kitchens, spacious living and dining areas – some with fireplaces, private or shared bathrooms and covered porches with breathtaking views. Rustic log-cabin villas have high ceilings and are furnished with authentic wooden décor and finishes, fully equipped kitchens with all the appliances necessary for self-catering and cooking, living rooms with fireplaces, and bedrooms with king or queen-size beds and private bathrooms. Amenities at the lodging include picnic tables and fire pits, a games rooms, a fishing pond, two mini-golf courses, and access to the nearby Jellystone Warrens Water Park. Warrens Lodging features seven well-appointed, multiple-bedroom villas with high ceilings, log-style décor and furnishings, and modern amenities. Two to nine-bedroom villas feature king or queen-size beds dressed in luxury linens and hypoallergenic pillows, and en-suite or shared bathrooms with walk-in showers, soaking tubs, or combinations of both, fresh towels, bathrobes, and organic bath products. Sitting areas have comfortable armchairs and sofas, some have fireplaces, and modern amenities include air-conditioning, flat-screen televisions with cable channels, alarm clocks, irons and ironing boards, hairdryers, and complimentary wireless Internet. Private porches have outdoor seating and boast beautiful views of the surrounding landscapes. Villas range in size and layout and include Drake (two bedrooms, two bathrooms), Falcon's Nest (nine bedrooms and six bathrooms), Golden Eye (two bedrooms, two bathrooms), Golden Eagle (two bedrooms, one bathroom), Goldfinch (two bedrooms, two bathrooms), Hooded Merganser (two bedrooms, two bathrooms), Merganser Walkout (four bedrooms and three bathrooms), Mallard (Two Wood Ducks) (four bedrooms and four bathrooms), and Wood Duck (two bedrooms, two bathrooms). Villas have fully equipped kitchens with appliances, including fridges, microwaves, coffeemakers, and utensils needed for self-catering purposes. Amenities at Warrens Lodging include picnic tables and fire pits, a games rooms, a fishing pond, two mini-golf courses, and access to the nearby Jellystone Warrens Water Park. Boasting awe-inspiring natural beauty, historic charm and a wealth of family-friendly activities, Warrens, Wisconsin is an alluring vacation destination in the heart of the Cranberry Capital. Recreational pursuits include the Wisconsin Cranberry Discovery Center, the McMullen Memorial County Park, the Black River State Forest, the Antique Mall of Tomah, and Jellystone Warrens, which is home to a water park, cafés and restaurants, planned activities and themed weekends.